Brighten your culinary palate with this noodle dish traditionally served at large banquets. Korean restaurants offer this popular dish as an appetizer. It's also a great way to use any leftovers you may have! 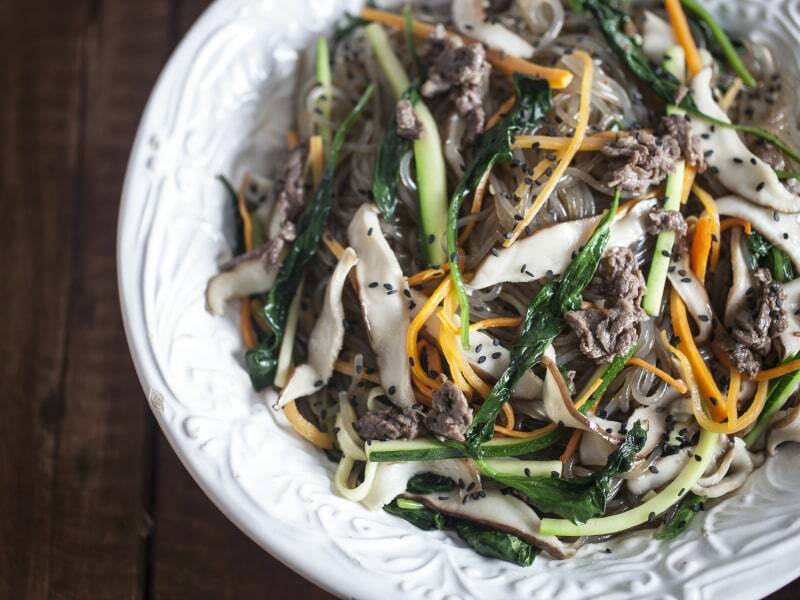 Carrots, spinach, shiitake mushrooms, and zucchini are quickly stir-fried in sunflower oil. Then thinly sliced beef short ribs are also quickly stir fried and added to the dish. 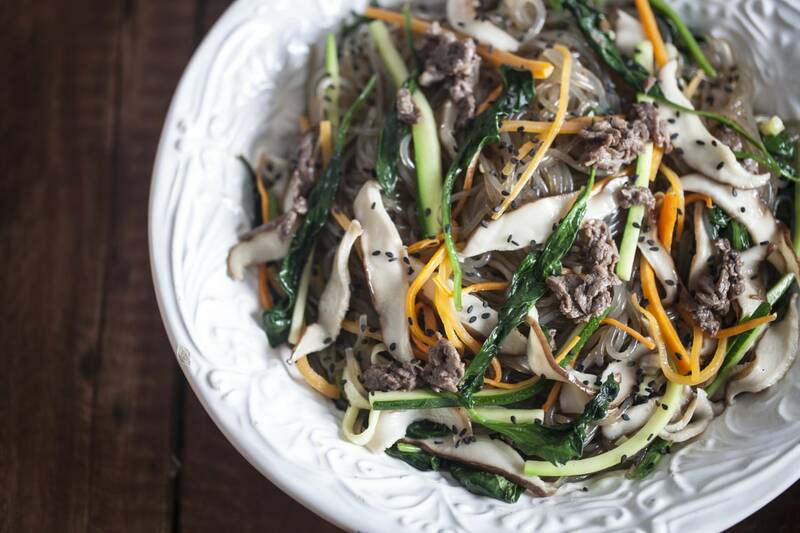 Everything is tossed with thin cellophane noodles and a simple soy and sesame sauce. Prepare ingredients ahead of time and reserve in the refrigerator to help save time in planning healthy meals for the week! You can purchase the Korean vermicelli noodles at Asian Markets or online. Per Serving: 641 calories; 45g fat; 39.1g carbohydrates; 24g protein; 57mg cholesterol; 1045mg sodium. Made this without the short ribs last night for dinner with some bulgolgi beef that I picked up from the market. This noodle dish accompanied the beef perfectly. I didn't have any sunflower/safflower oil so used canola which worked just fine. I had never had stir fried vermicelli until now. I loved it! I loved all the vegetables together, especially the mushrooms. I usually smother everything in soy sauce, but this didn't need a whole lot because it was already so flavorful. Found Korean vermicelli noodles at an Asian Market in my neighborhood. First time trying and loved it. Used chicken instead of beef and it was fantastic. Used a soy and sesame dressing for tossing and it was perfect. Skipped the meat all together and just did the veggies stir-fried in oil. I really liked the thin cellophane noodles, I think they're a new favorite. Great for lunch and weeknights. Lots of great flavor and perfect for making ahead of time. Also used tamari instead of soy sauce. I think this is my favorite new stir fry now.